As one of most beautiful natural beaches in Key West, Fort Zachary Taylor State Park offers everything needed for fun in the sun, as well as a bit of history with a pre-Civil War Fort. Explore this 87-acre state park and spend a day at the beach swimming, snorkeling, diving, fishing, hiking, biking, and picnicking with the Gulf of Mexico and the Atlantic Ocean as your backdrop. Play on the mix of sand and rock and dive into the turquoise waters for swimming and snorkeling. Explore the rock-pile barriers just offshore and swim with rich tropical marine life including parrot fish, yellowtail snapper, lobster, and coral reef. The wooded nature trails are ideal for hiking and bird watching. 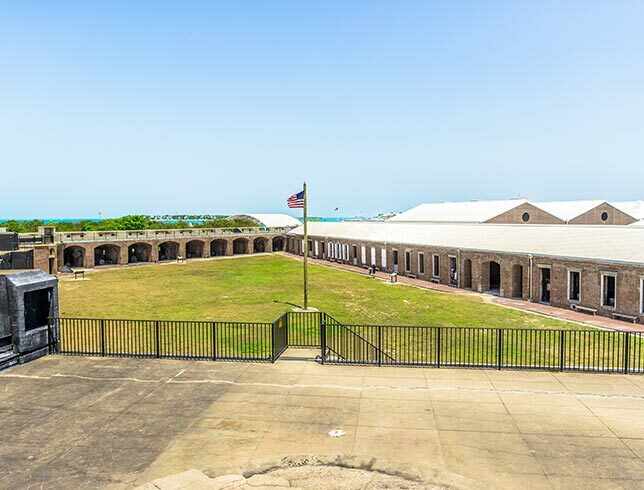 Follow the shaded paths along the shore and bike past the historic fort and Key West Shipping Channel. Take a guided tour of Fort Zachary Taylor and see the cannons used in the Civil War. Stay all day and witness a postcard-like sunset before returning to Southwinds Motel. $6 per vehicle. Limit 2-8 people per vehicle. $2 for pedestrians, bicyclists, extra passengers. $4 for a single-occupant vehicle or motorcycle. The park is open daily from 8 am until sundown. The fort closes at 5 pm. Does Fort Zachary Taylor Key West have a beach? Yes, Fort Zachary Taylor State Park has one of the best beaches in Key West. It is where the turquoise blue waters of the Gulf of Mexico meet the Atlantic Ocean and offers visitors a perfect place to swim, relax, rent a jet ski or snorkel. There are shady spots for picnics or to catch up on a good book. Sands are a bit rocky, but the unparalleled atmosphere makes up for it. Where can I go snorkeling at Fort Zachary Taylor Park in Key West? Fort Zachary Taylor State Park offers some of the best snorkeling right from the beach due to the exceptionally clear water and unique marine environment. Swim with snappers, grouper and parrot fish. Bring your snorkel gear or rent it there, as this is a great place for beginners or novice snorkelers to explore.